You can save yourself a heap of time and trouble by doing a routine hiking gear check at the trail head before every hike. It's a habit any seasoned hiker has developed over the years. If you're a newbie hiker, why not start on the right foot by doing a systematic gear check before tackling the trail? Think in terms of comfort and safety. Also become one with the word "prevention". Your hiking gear is different than mine in the details, but essentially we both carry a pack, wear sturdy trail wear and hiking clothing, and probably have the same hiking accessories: trekking poles, for instance. Here's my methodical approach to a hiking gear check, before each and every hike. Feel free to modify it for your needs. A hiking gear check can make your hike much more pleasant! I start with my boots. Are they laced too loosely? Wiggle those toes and see how things feel down there! Or an even worse scenario: Boots laced too tightly? It's gonna be "ouch time" before you know it, especially on the down hill parts of the trail. You won't know for sure until you take several steps with your pack on. But you can get a clue just by standing in your boots. I know, I know it's irritating to stop and untie the boots right off the bat, but if you wait, you run the risk of developing blisters or hot spots. Or limping back to the trail head with sore feet. So that's why I take the time to pay attention to where my boots feel weird. Maybe it only takes a simple sock adjustment. Often, one of my socks is inside out and the seam hits my toes in the wrong place. Or I didn't take time to position the liner sock with respect to the outer sock, and have to do it now. Other times there's a pebble in my boot, or a stick left over from the last hike. Eviction time!! Whatever the issue, I take the time to fix it. Please don't make the newbie mistake of just "sucking it up", because it will eventually lead to foot troubles. Next, I do a mental clothes check as part of my hiking gear check. How do my hiking pants/shorts feel? Should I adjust the waistband? Is there too much junk in my pockets? Are my car keys jabbing me, and should be relocated to my backpack? Full disclosure: Sometimes my underwear and my pants are locked in mortal combat. A quick discreet adjustment does the trick. Other times, I need to step into the woods for a minute to fight the battle and win the war. Another question I ask myself: Am I wearing too many layers? Rookie hikers make the mistake of starting off a hike with a jacket, a long sleeved shirt, a thick hat, and gloves - just to ward off the morning chill. Five or ten minutes into the hike, they have to stop and peel. ... which messes their hiking pace, forces the body into sudden thermoregulation cycles, and makes muscles cranky. That's why I like to err on the side of feeling chilly for starters, and never start off with a jacket unless it's snowing or raining. Read more about hiking clothing layers here. Endure a few minutes of feeling a bit cool, and rely upon the heat generated by your skeletal muscle contractions to make you feel toasty warm soon after you start hiking. How's life with a backpack on? After I'm satisfied that my clothing won't chafe, irritate or bind me, I take a few steps and ask my back and shoulders to check in with my pack. If you are wearing a properly fitted backpack, you should have several options for adjustments at the shoulders, chest, and waist. Don't be afraid to tug on all of those cords and toggles, if only to experience how the pack feels differently on your body. I routinely wore my day pack way too high on my shoulders until I tugged on just the right cord, and Ah! experienced the relief of a better fitting pack. 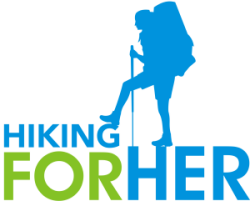 I see many hikers that don't have a backpack that fits their frame, or needs adjustment. Don't be that hiker! 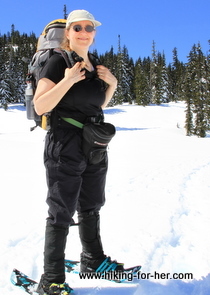 Alternatively, have your hiking partner make adjustments if you can't grasp the cords while wearing the pack. Sometimes a hiking gear check takes more than one set of hands! Next, I do a quick mental check-in regarding how my pack is packed. Anything jingling or rattling around? Too much weight over my shoulders, when it should be directed more towards the bottom of the pack where my hips can deal with it? Is my load balanced, or am I being pulled to one side? Are my water bottles securely stowed in their original upright position?! These little things can drive any hiker crazy after awhile, especially on a multiday backpacking trip. If you routinely use adjustable hiking poles, it's important to check how they're functioning, too. Did I adjust them to the right height? How do they feel in my hands today? What do my shoulders say about them? Should I use the wrist straps, or can I do without them? Are they necessary on this stretch of the trail? Maybe I should stow them on my pack. One last hiking gear check: my head. Is my ponytail/braid/bun playing nicely with my hat? Are my glasses sliding down my nose? Do I need to apply lip balm already? If I'm sneezy, where are my tissues? Should I put my sunglasses on a cord around my neck? Your brain is your most important piece of hiking gear, because by making good decisions you'll have an enjoyable and safe hike. Pay attention at the trail head to little things that can really jam up your hike. Maybe it's time for sunscreen, Or will I be in a shaded area all day? Have I forgotten the lunch sack? How long will it take to reach my objective for the day, or my turn around point if I'm just out on an exploring hike? It might be time for a quick map check. Also scope out people who are acting strangely at the trail head. You know that "uh oh" feeling, right? Is anyone lingering or lurking? Hikers don't do that! Pay careful attention to their license plate number, physical description and anything else that can be used to identify them later. And if you're hiking solo, be sure you're not being followed once you get started on the trail. Once I've been walking for 15 minutes, I check in again with my feet. They rule the roost on a hike, as far as I'm concerned. If they ain't happy, ain't no one happy. Or going anywhere! Thus, if I feel any pinching or heat anywhere on my feet, I stop and remove my boots and socks. I sometimes duct tape the contact points between feet and boots pre-emptively, just to head off trouble. These little hot spots could blossom into full blown blisters if I ignore them. I carry duct tape wrapped around my water bottle, in case I need it during the hike - when I'm sensing too much heat in any one area. You could also stash some on a trekking pole. Another thing to consider: your boots might be laced incorrectly. Read these tips so you'll know how to change up your lacing strategy. As you can see, I am a firm believer in being comfortable and safe during a hike. It only takes a few moments to check in, and make the necessary adjustments, to ensure a great hike. Tip: Don't feel that you have to apologize to your hiking companions for having to stop to make adjustments once you get rolling. If they're seasoned hikers, they'll understand the importance of a hiking gear check at the start of the day. And regular check ins along the trail! Because in the long run, it saves everyone time and keeps everyone safe. Regular gear checks: what a great habit for any hiker to develop, and now you have some tips to get you started.